This work was painted at Ville-d'Avray near Paris, to where the artist had fled in order to escape his creditors. Begun in the summer of 1866, it was finished during the winter. At least three of the figures were modeled by Camille Doncieux, then Monet's mistress and later his wife. 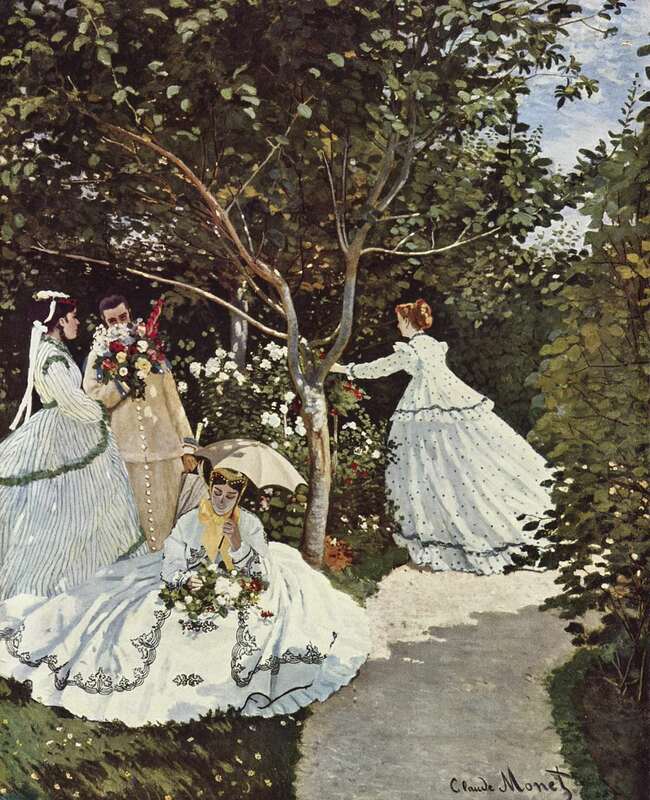 Though finished in the studio, much of the painting was done outside and, because of the size of the canvas, Monet had to dig a trench in the garden into which the picture could be lowered so as to enable him to paint the upper parts. He would also stop work as soon as the light faded, and this determined adherence to open air painting was laughed at by both Courbet, who was an occasional visitor during its execution, and Manet. Important in Monet's development, this picture shows how the artist's palette was brightening and reveals his careful attention to light effects. The woman in the foreground sits in a blue-toned shadow, the result of light from the sky reflecting up from her white dress, while in the figure on the furtherest left flesh tones show through her dress. Aside from its progressive technique, there are possibly other reasons why the work was refused for the 1867 Salon. A painting of this scale was expected to transmit some elevating message through ennobling subject-matter, yet the viewer is offered nothing of this here: there is no obvious narrative or other link between the elements of the picture nor is there even a focus of attention. Instead we are merely presented with an everyday, outdoor scene (though, like most of Monet's works, it is carefully organized).